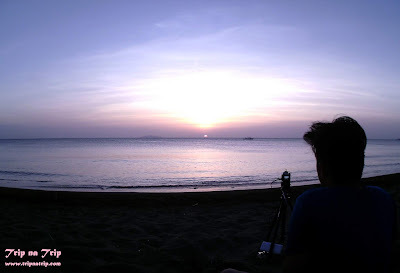 This beautiful sunset view can be found on the shore of Nasugbu Batangas, which probably in parallel with Munting Buhangin Resort. It is a quite place to spend a vacation with friends, family, or even alone. With the sound of waves, this place is really perfect for unwinding. Phucking Phred Resort, "Yes!" that is its given title as the resort to be called. The owner is quite jolly and easy going so enjoy for simple convo on the visit when he is around. This resort includes villa, standard country style bar, an over looking cottage, and regular cottages on sand. This resort is properly fenced and regularly cleaned by its maintenance in which children can safely play on the sand. Grilling and other preparation of food are allowed that the maintenance personnel will also provide some basic materials for it. When the sun started to go down, try to walk along the shore because it is so relaxing. From metro manila, catch a bus along Roxas Boulevard that is going to Nasugbu. Inform ahead the driver to drop you off at the Bus Stop particularly town area that you can ride a tricycle. Then, tricycle ride going to Phucking Phred Resort along Bernabeach and other resorts.